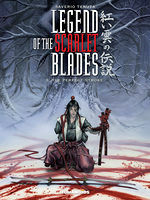 Follow the journey of the amnesic ronin Raido in a medieval Japan where spirits still exert their magic on the land. 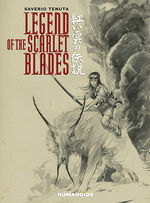 Raido, a young amnesic Ronin–a masterless Samurai–roams about in a quest for his memories. 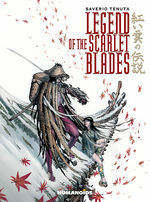 His first stop is the city that talks to the sky, the ultimate stronghold against the ice invading the land of the rising sun. There, he meets Meiki, a graceful puppeteer and storyteller of charms. 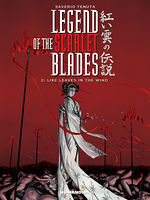 "Legend of the Scarlet Blades," as painted by the tormented and airy style of Saverio Tenuta, is a series whose universe is inspired by feudal Japanese history and traditions, full of breathtaking settings and populated by a myriad of wondrous mythical beings. A brilliant and emotional work, this is a book that everyone should know about. 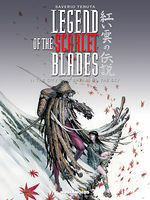 I was taken with it's beauty but the story itself is one that will leave a last impression. Tenuta’s painted art is absolutely stunning. 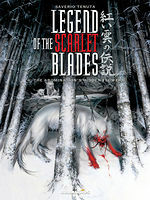 In a winter setting full of snow and gigantic white wolves, blood, red leaves, and Raido’s scarlet blades stand out in stark, beautiful contrast.